In The Rundown, Deadshirt dives into our cardboard long boxes to shine a light on important, unusual or otherwise remarkable comic runs (mainstream or otherwise) from a specific creative team or teams. In Peter David’s first outing as a professional comic book writer, he produced what is largely considered one of the best Spider-Man arcs in the history of the character. David was brought onto the project after Spider-Man editor Christopher Priest (né Jim Owsley) was reportedly looking to shake things up on the Peter Parker title and create some contrast with the lighter tone of workhorse writer/penciler/inker Al Milgrom’s run. While the resulting arc—a mere four issues—is considerably shorter than what we at Deadshirt would generally consider a “run,” this arc certainly feels like it’s earned its own Rundown. 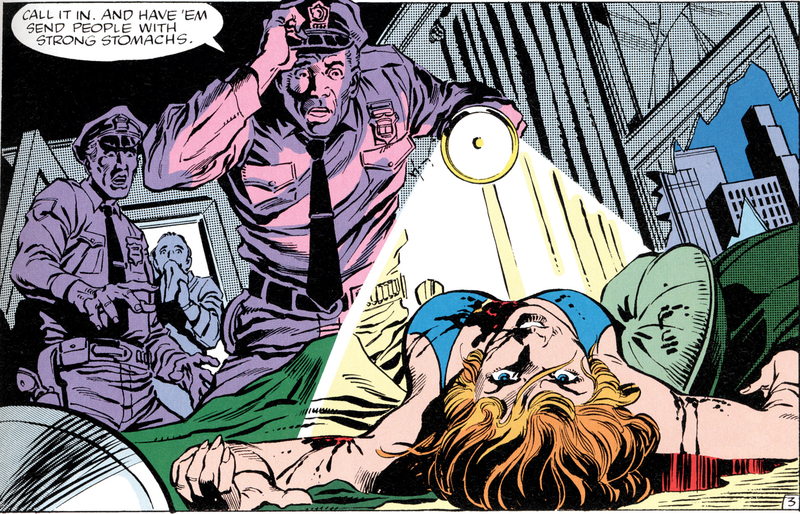 The first issue, published October 1985, opens, as you may have guessed, with the death of Jean DeWolff, long considered Spider-Man’s only friend on the NYPD. 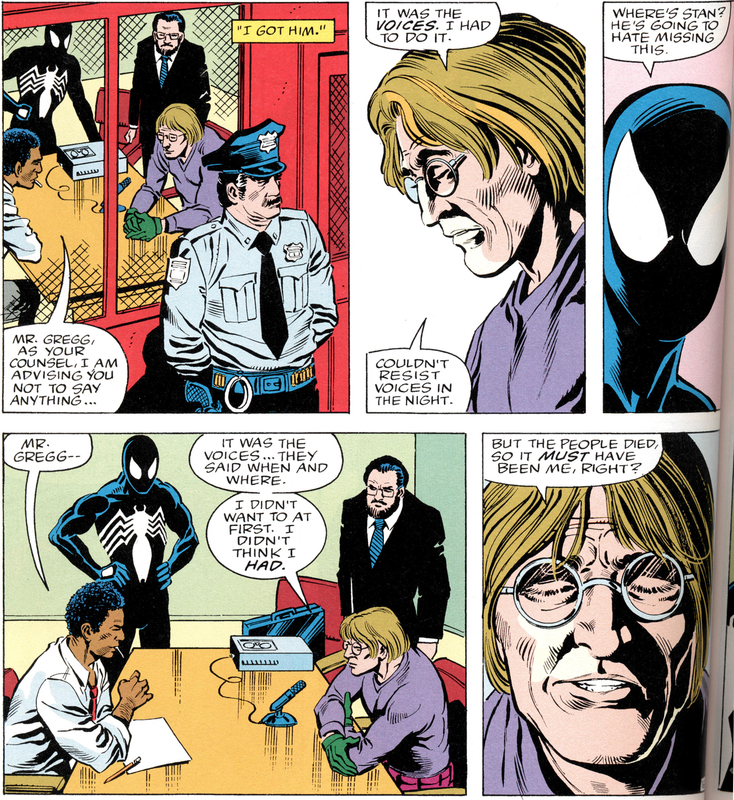 Eschewing the corpse-and-credits open that Law & Order would make famous about a decade later, DeWolff gives us a couple pages of flashback and narration from the titular character’s point of view, making sure even those readers unfamiliar with DeWolff’s relationship with Spidey would feel the force of her death on page 3, helping to keep this feeling too much like a straight-up fridging. When Spider-Man finds out about his friend’s death, he vows to catch the killer and offers his services to Stan Carter, the lead investigator on the case. 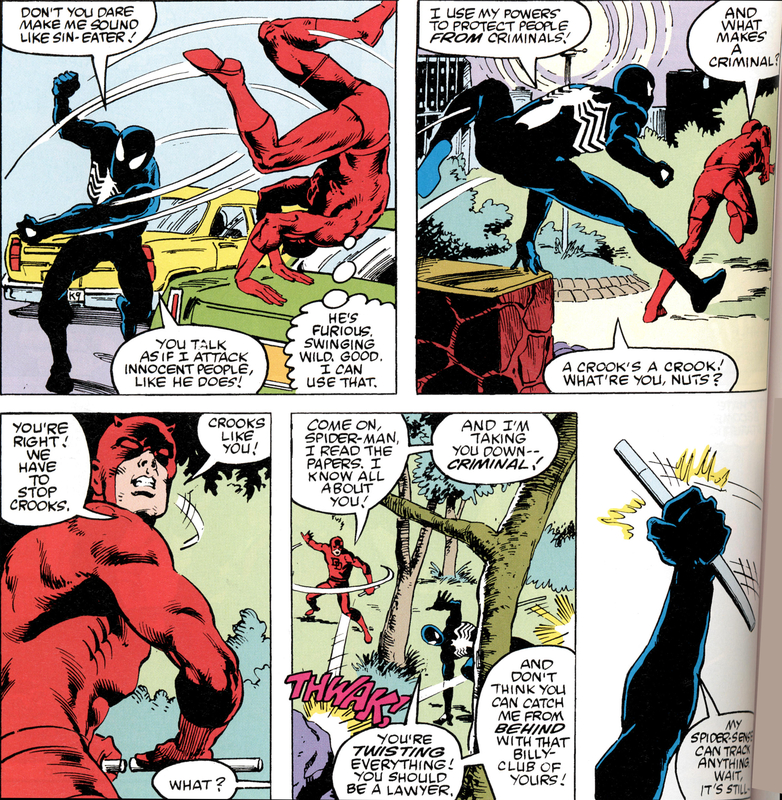 Daredevil gets involved not long after when Jean’s killer takes out a judge—who is also a friend—with Matt right there in the room. What ensues is a well-crafted detective story that explores distinctions among legality, morality, and ethics (ever the key Daredevil themes), and the blurred line between culpability and guilt, a muddled distinction that is arguably the entire reason Peter Parker is Spider-Man. Throughout this arc, Rich Buckler’s lantern-jawed, self-assured heroes take on his wobbly, doubt-inducing Emil Gregg [SPOILER] and, later, his equally strong-jawed and -willed Stan Carter[/SPOILER]. The inkers and colorists provide the heavy shading that drive home the tone of a Spider-Man noir story—perhaps ridiculous on its face, but so well executed here—making the stakes felt without sacrificing the bright clarity of the attractive, realistic Neal Adams-influenced art that dominated the period. While it’s hard to pick just one of the four issues to point to specifically, the third in this arc does a lot of the story’s legwork, both in terms of plot and themes. This is the issue where [SPOILER] the copycat Sin-Eater is arrested during what he characterizes as an intentionally botched attack [/SPOILER]. Riddled by guilt and a shaky sense of purpose (ahem, looking at you, Spider-Man), this character wants to atone for his wrongdoings, but Matt’s legal and ethical concerns about the man’s sanity (and, by extension, culpability for his actions) keep him from facing judgment just yet. Meanwhile, Spider-Man comes off extra-furious in this arc, to the point I found myself wanting to double check if this was simply Black Suit Spidey and not Secret Symbiote Spidey (an issue that is resolved by re-checking the timeline, or when our hero runs out of webbing; his not being symbiote-influenced indicates the anger comes from a place of emotional pain and not slick digs found in a space-prison). Spider-Man tears after the actual killer and proceeds to beat him to within an inch of his life, only stopping when Daredevil pulls him away and taunts the wall-crawler into chasing him around the city. This issue is where Matt’s idealism and strong sense of ethics truly shine through, and it’s also where the raw, emotional force of Peter’s righteousness is most apparent. The parallel between Spider-Man’s anti-crime crusade and the masked murderer’s quest to cleanse the city of sin is strong and unnerving, to Peter, Matt, and the audience. This arc raises a lot of interesting questions about what we believe when it comes to morality, justice and the law in ways we’d probably be discussing as “Watchmen-esque” if not for the fact it predates Alan Moore and Dave Gibbons’s masterpiece by nearly a year. However, for all of its broad themes, this story is quintessentially about Spider-Man, Daredevil, and their worldviews. The arc’s main antagonist, called Sin-Eater, is shown early on confessing to a priest and noting it has been a mere three weeks since his last confession, indicating a near-obsessive devoutness we only expect to see in comics from…well, Matt Murdock. For the villain to call himself Sin-Eater and claim he shoulders the burden of others’ sins and absolves them in the process elevates him from simple Daredevil foil to the position of a perfect answer to Spider-Man, the hero whose driving force is one sin for which he can never forgive himself. These traits allow Sin-Eater to serve as a fun house-mirror reflection of both heroes’ sense of what is right, providing each with a chance to examine the other’s perspective, as well as his own. This sense of uncertainty, and the implied challenge this arc provides for us to examine our own sense of right and wrong, make it one of the best stories I’ve read in a long time. For more Sin-Eater, check out Peter David’s return to the character a short two years later in the aptly named Return of the Sin-Eater arc, found in The Spectacular Spider-Man #134-136. Fair warning, though, it’s a depressing tale of the man behind the mask’s struggle with rehabilitation, both physically and in the eyes of society. This story is bundled with The Death of Jean DeWolff in the 2011 trade release. To feed my ego/conspiracy theory that the symbiote that would come to be known as Venom played a role in Pete’s dickishness here, read The Amazing Spider-Man #299-300, where it’s revealed that erroneous reporting on the Sin-Eater case by a young reporter named Eddie Brock ruined a journalistic career and spawned a hatred for Spider-Man that would keep Todd McFarlane very busy until Spawn took off. If you just love to watch Spidey squirm when his affable morality starts to get overtaken by his desperate need to be a Just, Violent Protector, have a look at The Second Hobgoblin Saga, found in Amazing Spider-Man issues #249-251, 259-261, 275-277, and 279. We hope you enjoyed this installment of The Rundown, and that you’ll consider contributing to Deadshirt on Patreon.